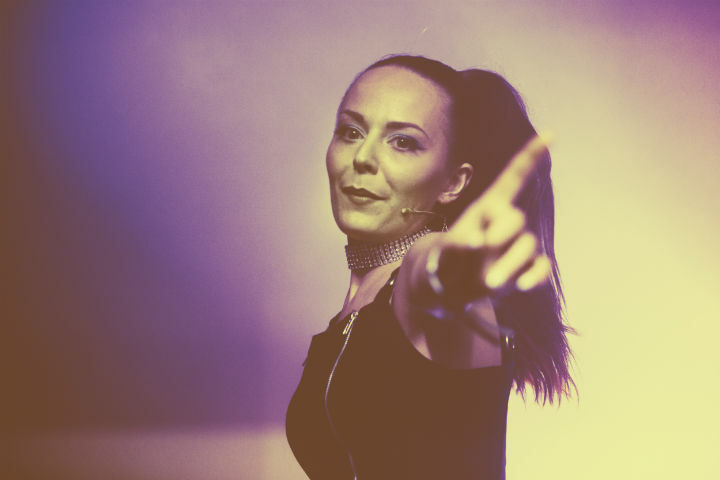 Hannah Diamond is the closest thing to a legitimate pop star on PC Music, and she looked the part as she came onstage swinging her top ponytail to an instrumental intro. She started her set with A. G. Cook collaboration "Keri Baby," which found her bounding around onstage but not necessarily singing anything; indeed, she stopped lip-syncing to the canned track as it played on behind her so often it seemed like she wanted to draw attention to it. That's frowned upon by traditional notions of what constitutes live performance, but in the context of PC Music, intention is key: Is obvious lip-syncing part of the performance? "I'm so excited to be here," she told the crowd, establishing her persona as the sweet, inclusive PC Music member, in stark contrast to the cooler-than-thou air of GFOTY. "Pink and Blue" sounded more like she was singing, and as "Attention" started, she employed some ballet moves, swishing around before settling down to sing the song's slower melody. It wasn't clear how choreographed Diamond's dance was, as she was the only one up there, but she seemed deep in concentration throughout the set, as if trying to remember the moves, adding drama and an air of seriousness to her performance. She ended with a momentous version of "Every Night," to which she added a widescreen opening and a streamer cannon climax, leaving the oddity (but not the entirety) of PC Music's showcase to climax with QT. Hannah Diamond Returns with "True"